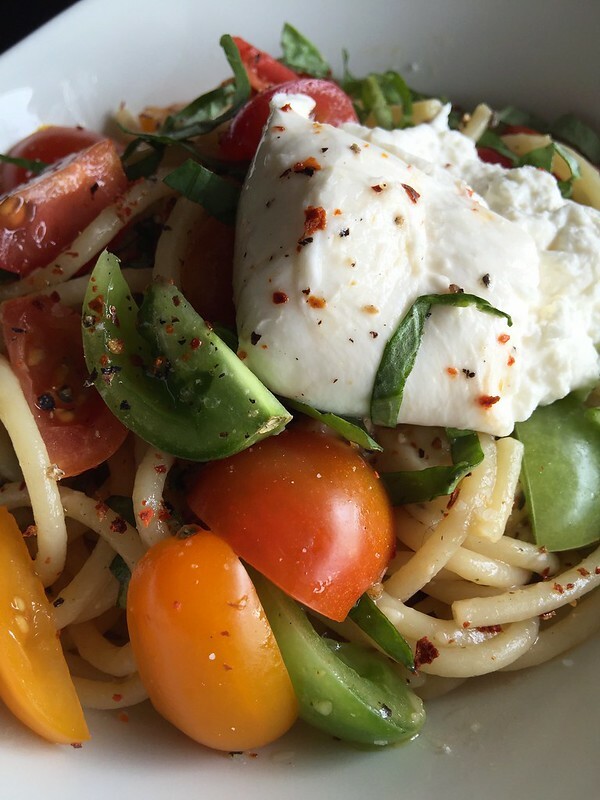 An heirloom tomato dish when we’re just days away from November? I know, but work with me people…..this crazy heatwave has got all of us in California out of sorts. Monday it was 97 degrees, Tuesday it was 99 degrees and today is 92 degrees —and I live on the coast! Mother Nature is not happy. 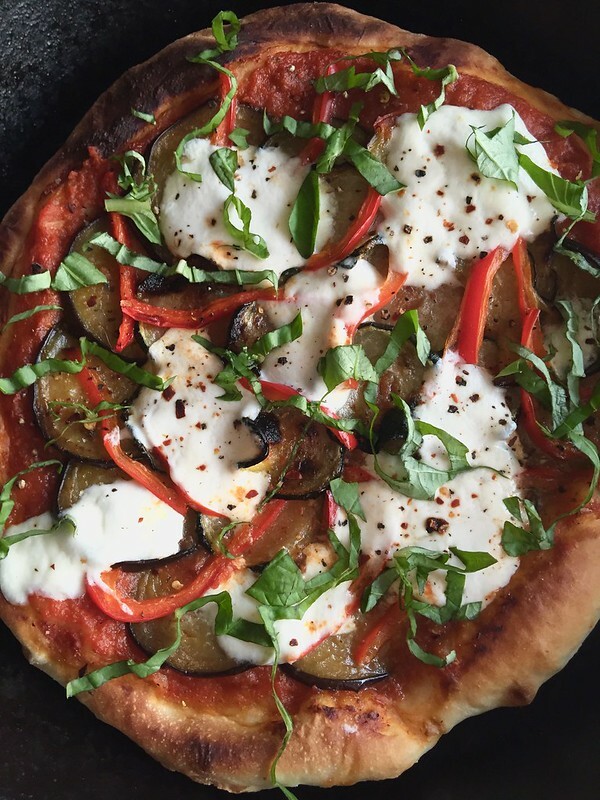 So in the meantime, you’ll get some summer inspired recipes from me. I made this beauty for last month’s family dinner as an appetizer but it could easily serve as a main course with a nice side salad. Perhaps a peppery arugula salad? And of course, a cold and crisp glass of white wine to go along is a must. This stunning tart is quite easy to whip together. 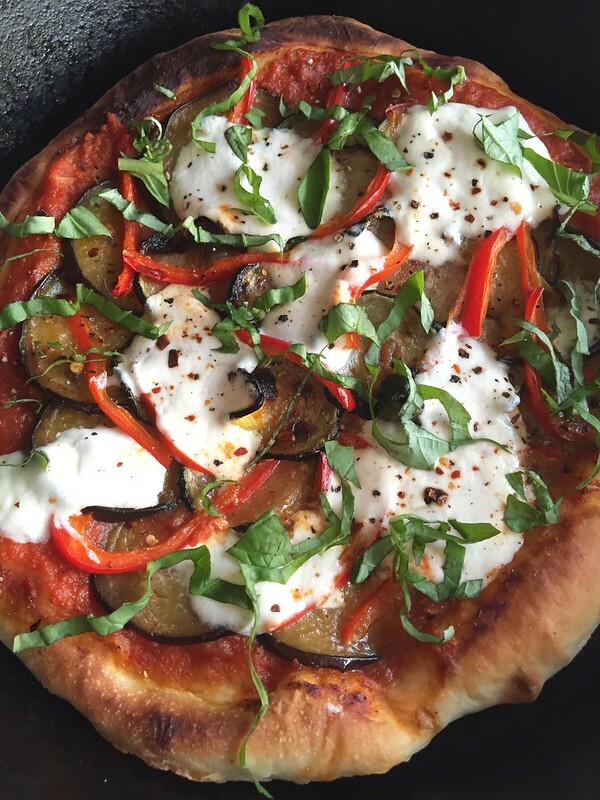 All you need is a few ripe heirloom tomatoes, store bought puff pastry, ricotta cheese, some basil pesto and just a couple of other kitchen staples. I used some pesto I had made a few days prior, but if you prefer, store bought is fine too. Just be sure to adjust for salt as needed. 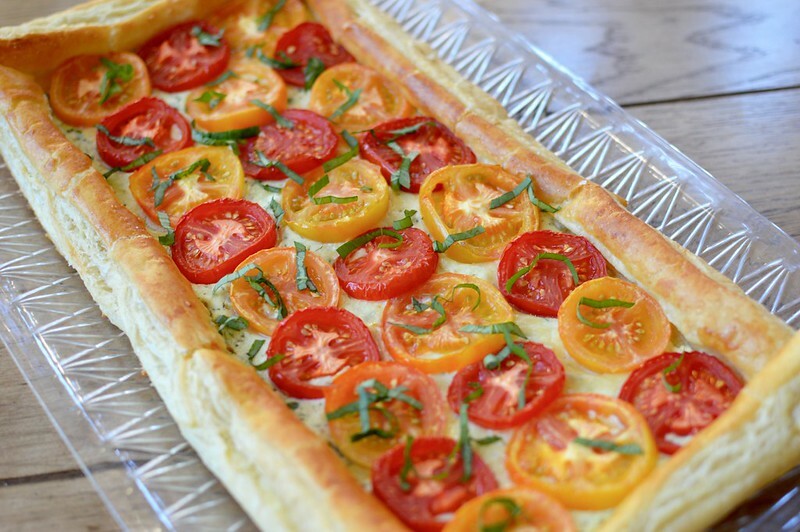 One thing to note is that since you’ll be baking the tomatoes (versus some other tomato tarts that bake the puff pastry first and then top fresh tomatoes on top), you’ll want to try and get as much moisture out as possible or else you’ll get a soggy mess. Just lay them out over a bunch of paper towels after they’ve been sliced and let them chill out for a bit while you take care of everything else. After some quick assembly and about 30 minutes in the oven, you’re done! Creamy textures from ricotta mixture, brightness from tomatoes and fresh basil–and flaky, buttery goodness from the pastry dough. Now excuse me as I stick my head in the freezer to try and cool down…..
¼ teaspoon red pepper flakes. Cut the tomatoes into approximately ¼ – ⅓ inch slices. In a single layer, place the tomatoes on top of 2-3 layers of paper towels to remove excess moisture. Place another paper towel on top of the tomatoes and gently press. Set aside. In a medium sized bowl, whisk 1 egg with the pesto. Fold in the ricotta, parmesan, garlic, black pepper and red pepper flakes until all items have been incorporated. Depending on your pesto, you may need to add some additional kosher salt. Set aside. On a lightly floured surface, overlap one of the pastry sheets with the other by about ⅓ inch. 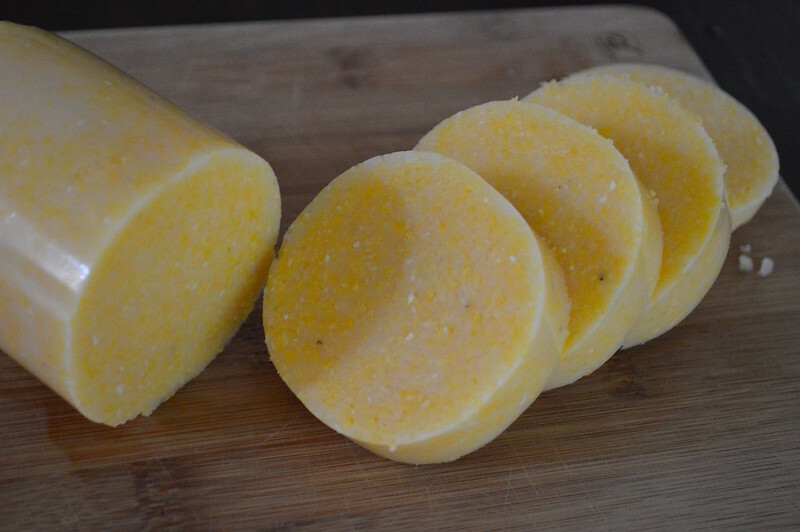 Gently press the seams together and roll out the combined sheet to about ⅛ inch thick. You’ll want to keep the dough in the rectangle shape and then transfer to a baking sheet lined with parchment paper. Cut a 1 inch strip off each of the four sides of the dough. 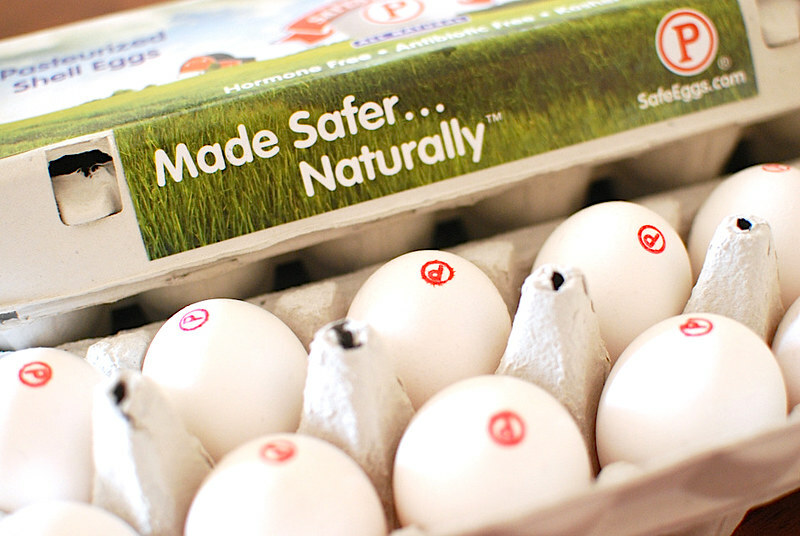 Beat the remaining egg with ½ tablespoon of water in a small bowl. Brush the sides of the large piece of dough and lay each of the four strips on the corresponding side. Gently press the dough down. Once the tart bakes, the sides will puff up. In the interior of the dough, evenly spread the pesto-ricotta mixture. Lay the sliced tomatoes on top of the mixture, slightly overlapping each slice. 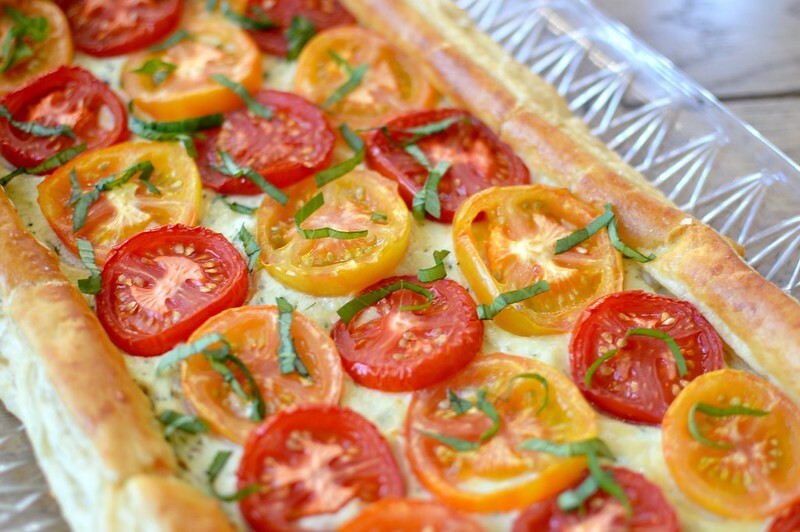 Brush the exposed dough with the egg wash mixture and sprinkle salt over the tomato tart. Bake the tart in a preheated oven at 425 degrees F for about 25-30 minutes until the pastry dough has risen and becomes golden brown. 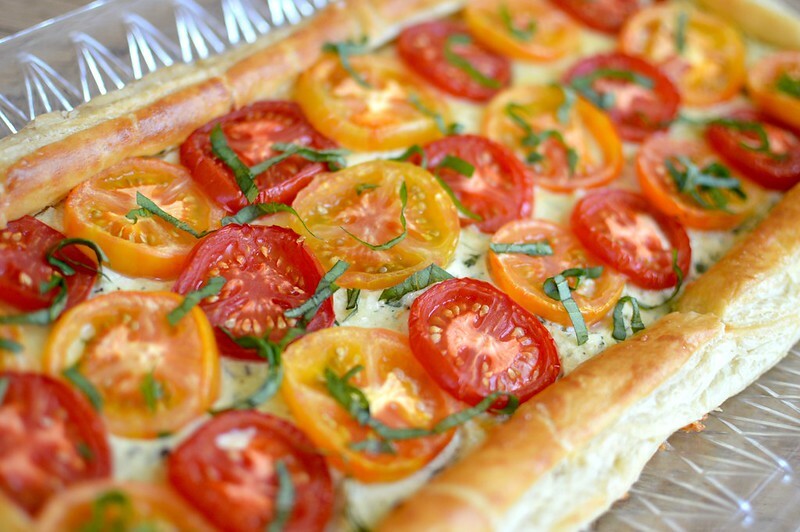 Transfer to a cooling rack and allow the tart to set for a few minutes before sprinkling the basil on top. Serve warm or at room temperature. At our last Family Dinner, we fired up a bunch of lamb racks and chops per my brother-in-law’s bday request. I initially was going to make a side dish that had potatoes in it but it seemed kind of heavy for such a warm day. I brainstormed with seester and decided to make some Israeli couscous. The pearls are larger than standard couscous and when toasted –like with risotto — it takes on a nutty flavor with a great texture. 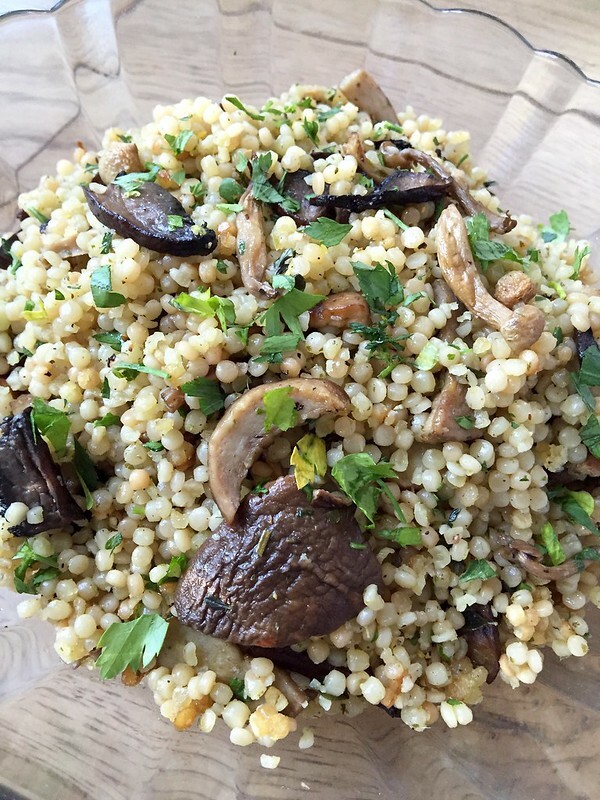 To flavor the couscous, I combined it with a medley of roasted mushrooms. I chose a combo of portabello, trumpets and beech ‘shrooms but anything goes. I also added dried porcinis as they have an earthy flavor and used the liquid that I reconstituted them in to deepen the profile. To finish it off, I added some fresh herbs and lemon zest to brighten up the dish. The couscous paired quite well with the lamb providing just enough substance without being too heavy. Combine the dried porcini with the hot water in a small bowl. Allow the mushrooms to soften and reconstitute for about 30 minutes. Remove the porcini from the bowl, squeezing out the excess liquid. Reserve the porcini liquid and set aside. Preheat oven to 425 degrees F. Toss the fresh mushrooms with 3 tablespoons olive oil, ½ teaspoon salt, ½ teaspoon black pepper, red pepper flakes, and garlic powder. 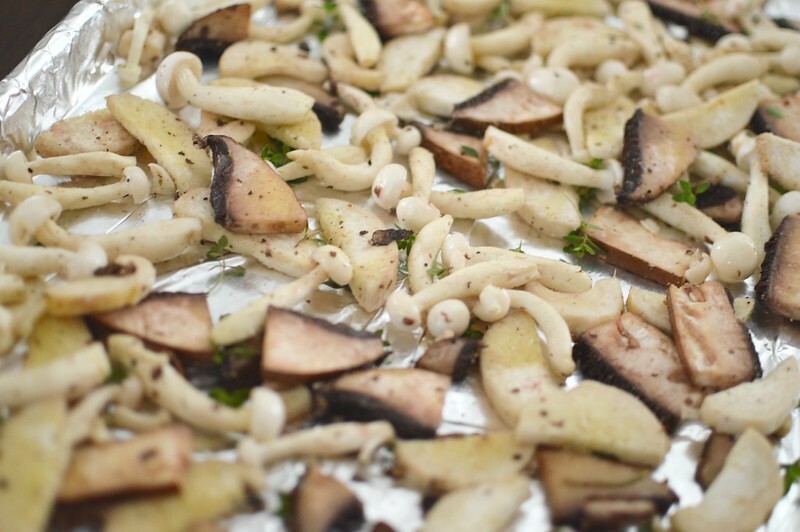 Pull the leaves from half the thyme sprigs and mix into the mushrooms. Spread the mushrooms on a lightly greased baking tray and roast for about 20 minutes, stirring every few minutes until they have browned. Set aside. Heat 2 tablespoons olive oil over medium heat in a small pot. Add the white onions and cook for 3-4 minutes until they become translucent. Add the couscous—stir and cook until the pearls become toasted and golden brown. Stir in the garlic and cook for about 20-30 seconds before adding in the liquid that the porcini was reconstituted in–careful not to add in the mushroom grit/sand. Pour in the heated vegetable broth, add the remaining thyme sprigs and bring to a boil. Lower the heat to a simmer, cover the pot and cook until all the liquid has absorbed—about 10-15 minutes. Once the couscous is done, take it off the heat and discard the thyme sprigs. 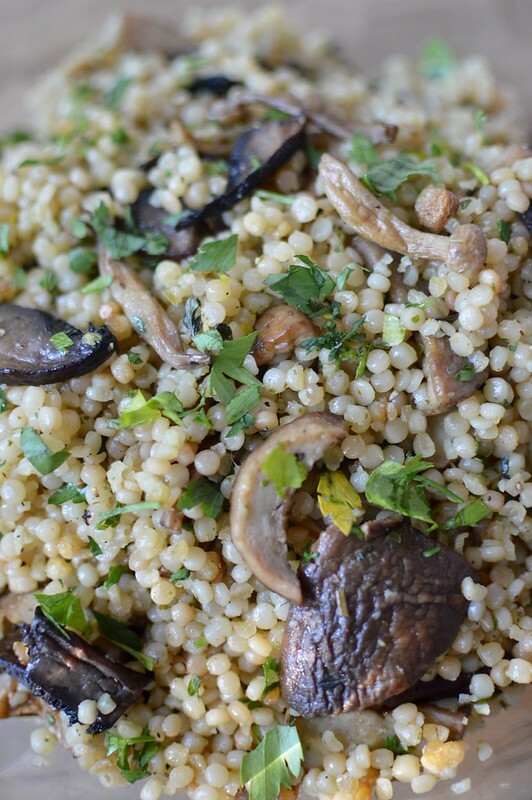 Use a fork to fluff the couscous pearls and fold in the roasted mushrooms, porcinis, parsley, and lemon zest. Drizzle in the truffle oil and taste. Add additional salt and pepper as needed. The couscous can be served immediately or at room temperature. 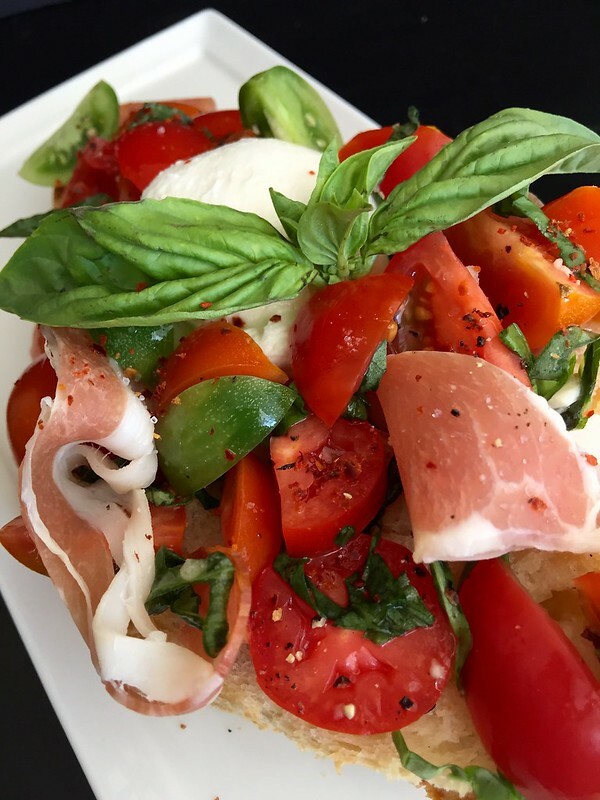 If you pop by mi casa in the summer, you’ll always find the kitchen stocked up on fresh basil, sweet tomatoes, cheeses and charcuterie. They are my absolute go-to ingredients during the warmer months when produce is beautiful at my local farmers markets. That’s when I crave bright and fresh dishes that are relatively low fuss to make but still pack tons of flavor. 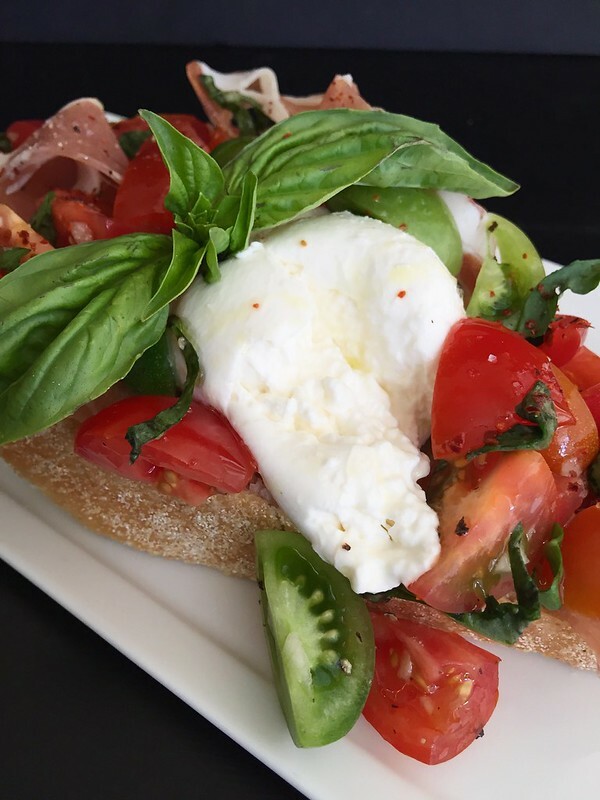 Which means my summer lovin’ romance with Caprese kicks in again….. 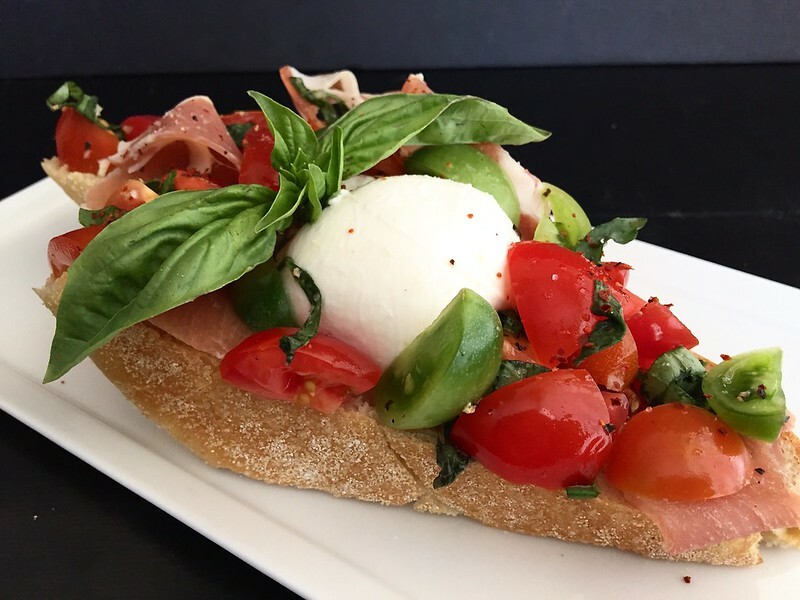 Typically caprese consists of sliced tomatoes, sweet basil and fresh mozzarella. 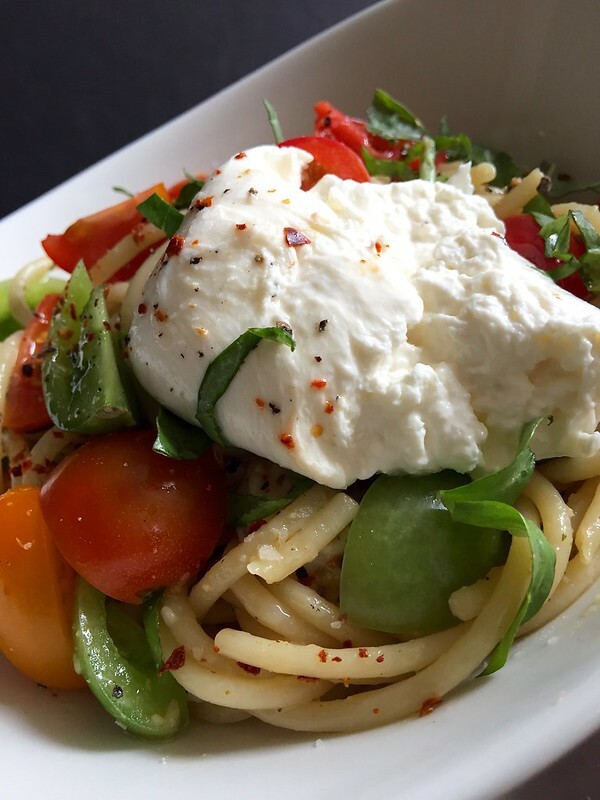 But these days I’ve been swapping out my usual Mozzarella di Bufala with Burrata. 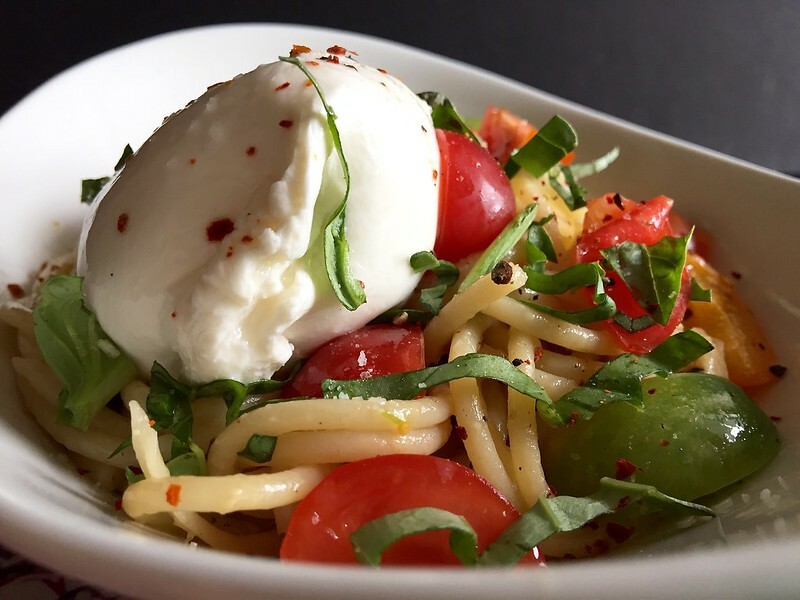 Burrata is also a soft Italian cheese that looks like fresh mozzarella but friends, it’s more—so much more! The exterior is made from mozz’ but then it’s formed into a round pouch and filled with a luscious mixture of cheese and cream. It’s rich, decadent and yet somehow light at the same time. I know–magic, right? So magical that I’ll be sharing three different ways that you can enjoy this flavor combo. And you can be sure as heck that I added prosciutto to the party! This is the simplest of the three dishes that I’ll be sharing but I’ve got to be honest, I’ve made this at least 2-3 times a week for the past month. I’m a gal out of control but trust me–it really is that good! I like serving this on a large slice of baguette as a main dish—protein, veg, cheese and carb. Major food groups, right? 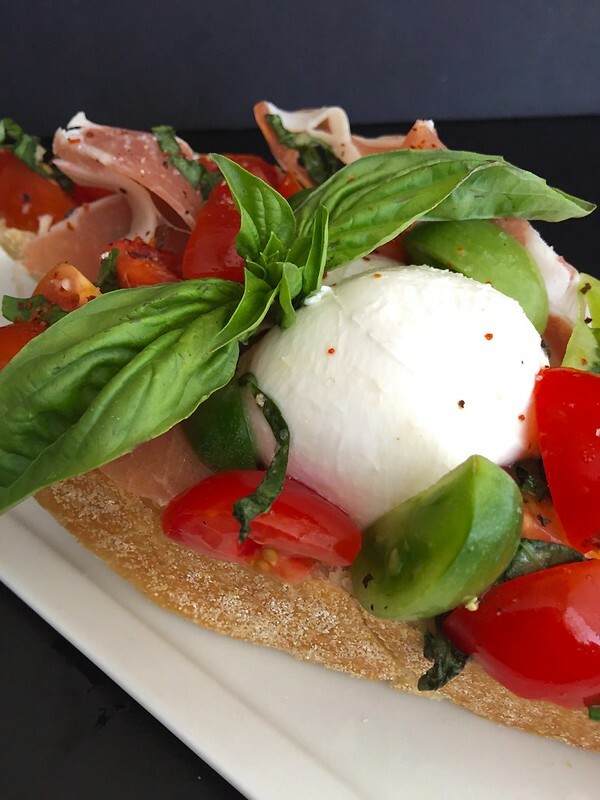 Though if you prefer to go with the appetizer route, serve them as crostini on smaller “crusts of bread”. That bite would definitely pack quite the punch. Just be sure to have a chilled glass of vino to go along with it all. 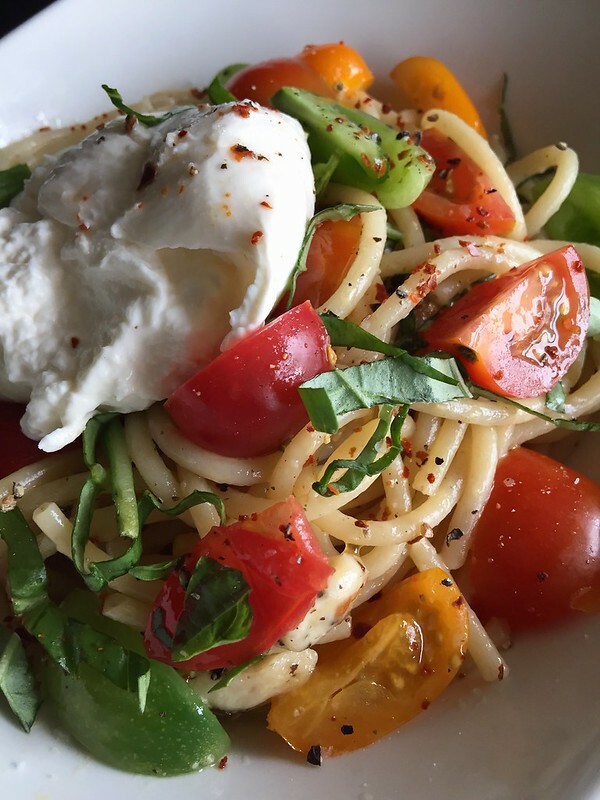 Stay tuned—Burrata Caprese Bucatini is up next! In a small bowl, mix together the tomatoes, garlic, kosher salt, black pepper, ½ tablespoon extra virgin olive oil, and julienne basil. Set aside. Brush both sides of the baguette slice with olive oil and broil in the oven until golden brown. Taste the tomato mixture and add additional kosher salt and black pepper as needed. Pile the mixture on top of the toasted baguette slice. 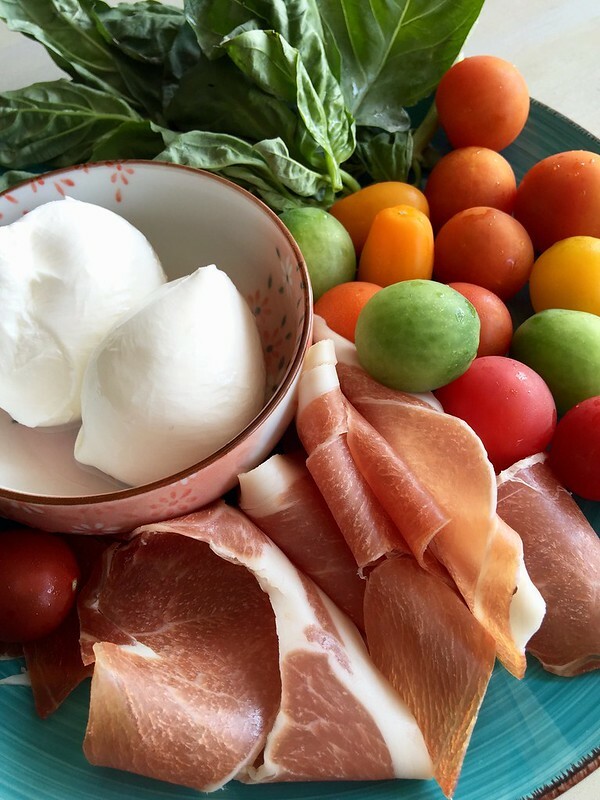 Top the with the burrata cheese and torn prosciutto. 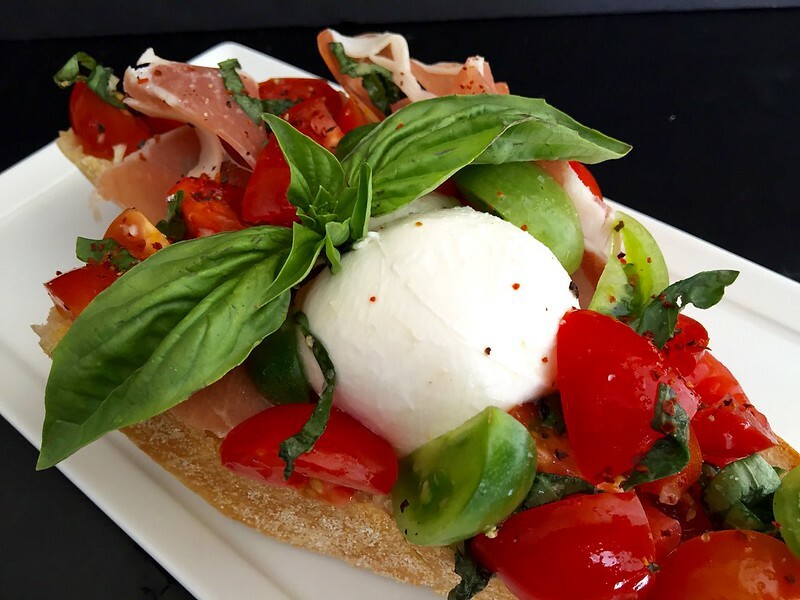 Drizzle the bruschetta with additional extra virgin olive oil and sprinkle with red pepper. Garnish with additional basil leaves. I know–it’s a mouthful right? 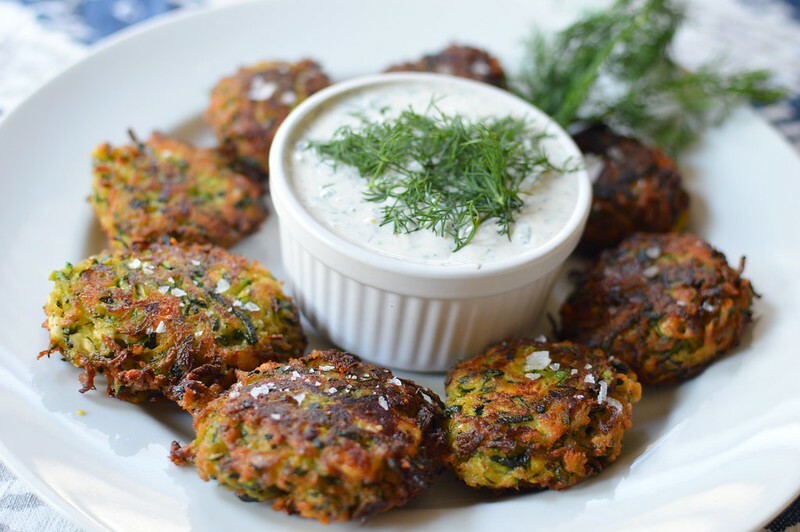 They are Greek style zucchini fritters and are a perfect dish for summer. Especially if you’re lucky like me and have coworkers who regularly bring you in some of their GINORMOUS, homegrown zucchini. 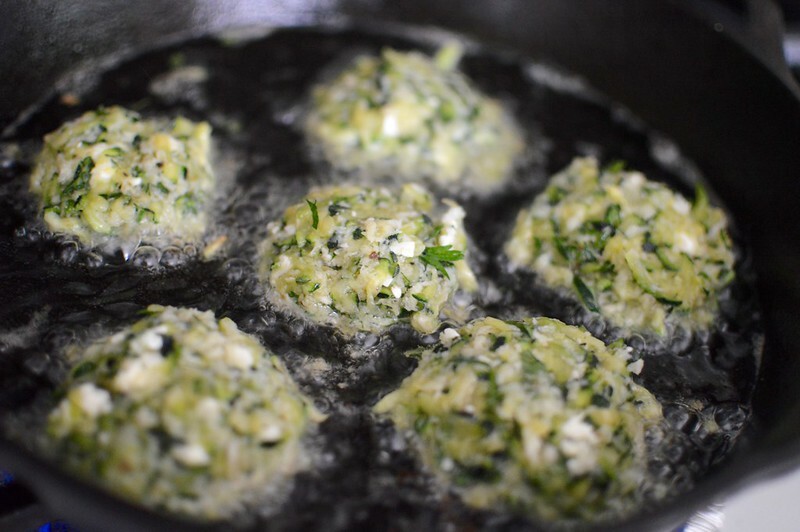 The fritters are filled with tons of fresh herbs, spices and of course, feta. I whipped up a batch of these golden beauties as appetizers for our most recent Mediterranean themed Family Dinner. But if you form the patties a bit larger, you could use them in Veggie Burgers or Sliders. 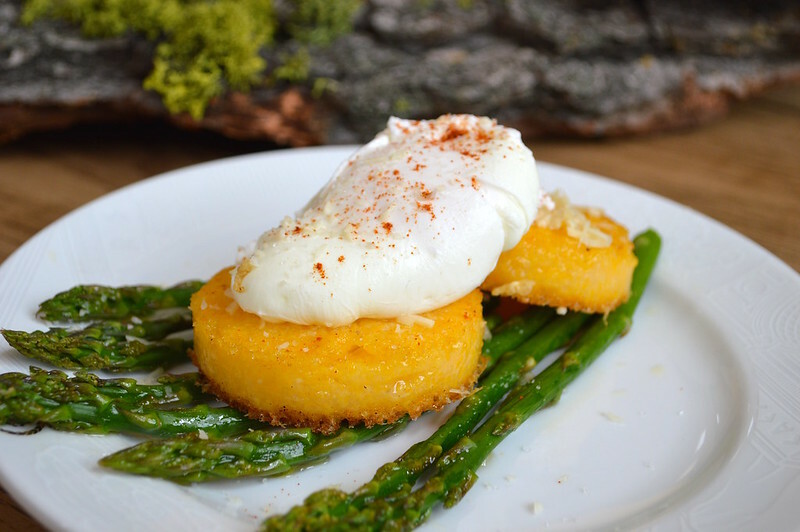 And of course, any leftovers would be brilliant for breakfast or brunch. 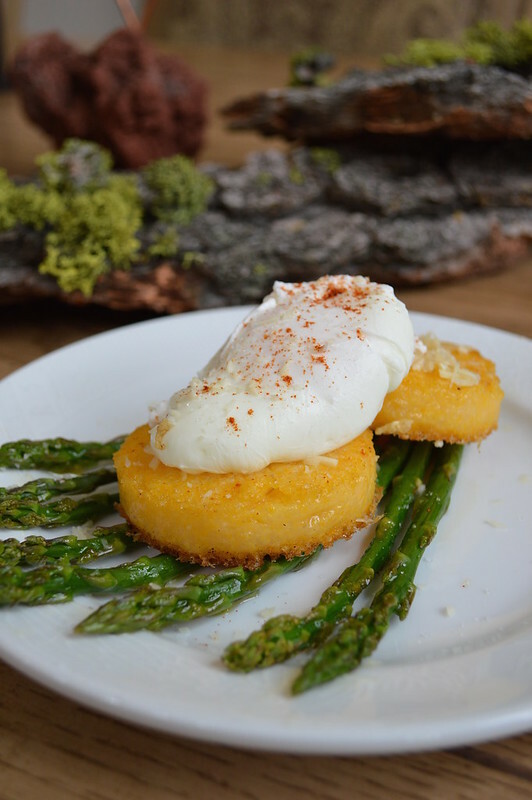 Just poach up a few eggs and perch them atop a crispy zucchini fritter. 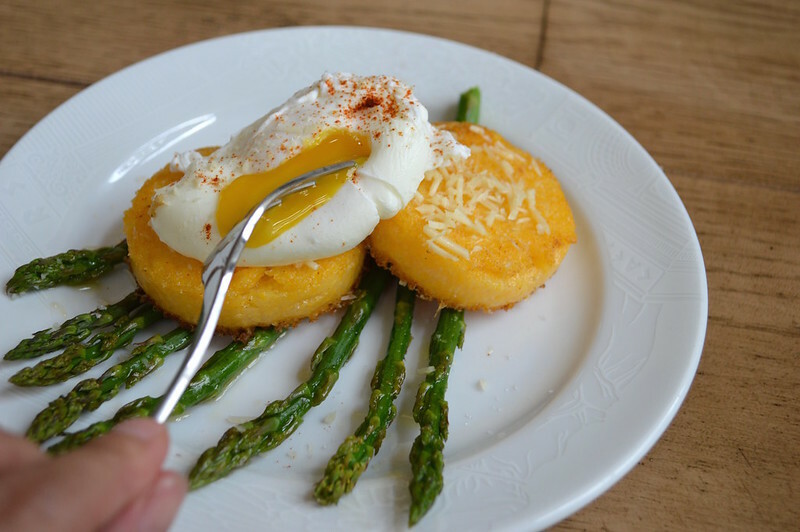 Can you imagine that gorgeous yolk oozing over the golden Kolokithokeftedes? 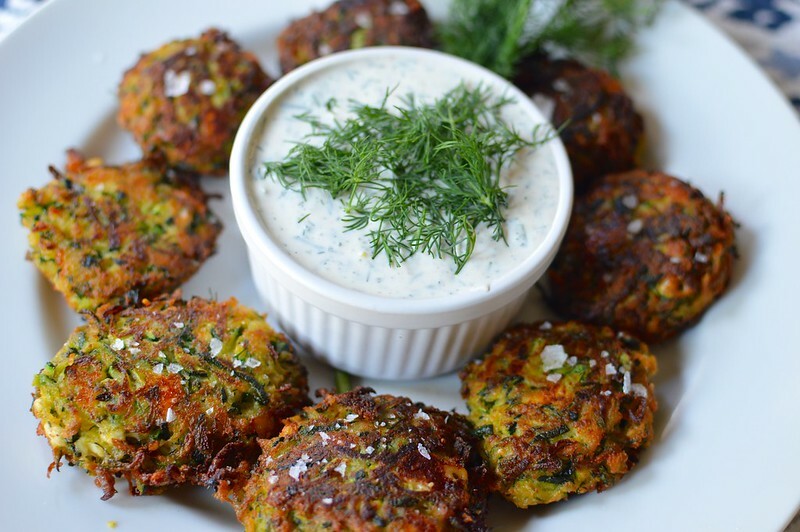 At dinner, I served them up with my favorite, cool and bright Tzatziki Sauce. And do yourself a favor, make a double batch of Tzatziki as it stores well in the fridge for a few days. It’s great as a dip with veggies, over grilled meats or fish and as a condiment over sandwiches and burgers. The patties can also be formed ahead of time and refrigerated the day before you want to fry them up. Great time saver for casual get-togethers or dinners. Wash and trim the zucchini. Using a food processor or box grater, grate the zucchini. Place the zucchini in a colander over the sink and sprinkle salt over the squash. Toss to combine. Allow the zucchini to sit in the colander/sink for about 2 hours to allow the natural liquids to be drawn out. Every 15 minutes or so, toss and squeeze the moisture out of the squash. While the zucchini drains, prepare the Tzatziki Sauce. Mix all the ingredients in a bowl. Taste and adjust with kosher salt and pepper as needed. Cover the bowl and refrigerate for at least one hour before use. After the zucchini has properly drained, transfer it to a large mixing bowl. Fold in the cumin, oregano, red pepper, black pepper, scallions, dill, mint, parsley and feta. Taste and add salt if needed. 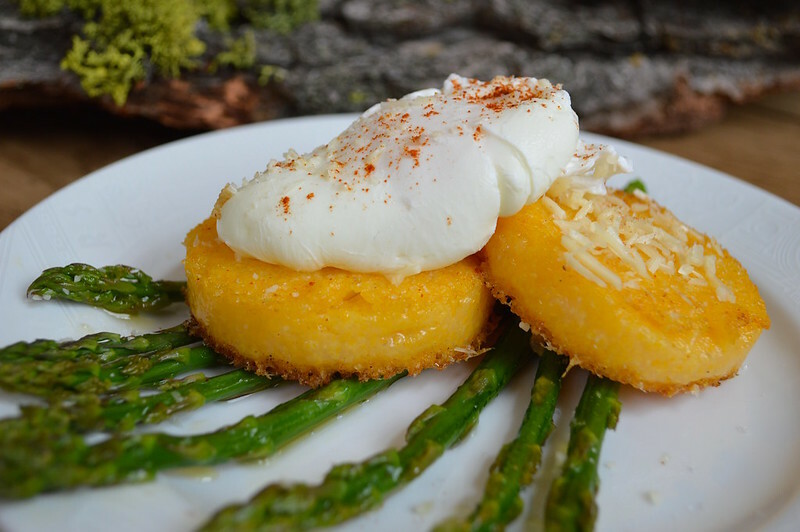 Stir in the beaten eggs and panko. If the mixture seems too wet to form into patties, add additional panko. Cover and refrigerate the mixture for an hour. Once chilled, form patties that are about 2½-3 inches in diameter. 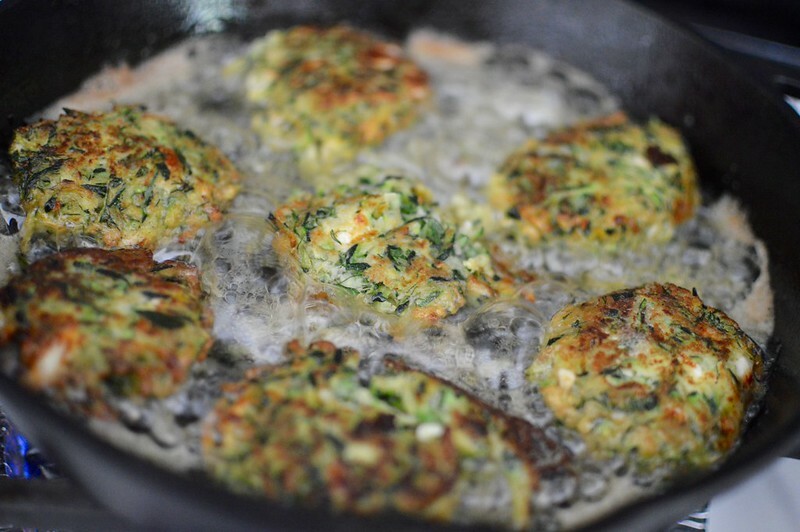 In batches, place the patties in a heavy bottom skillet that has been filled with about ½ inch vegetable oil over medium heat. 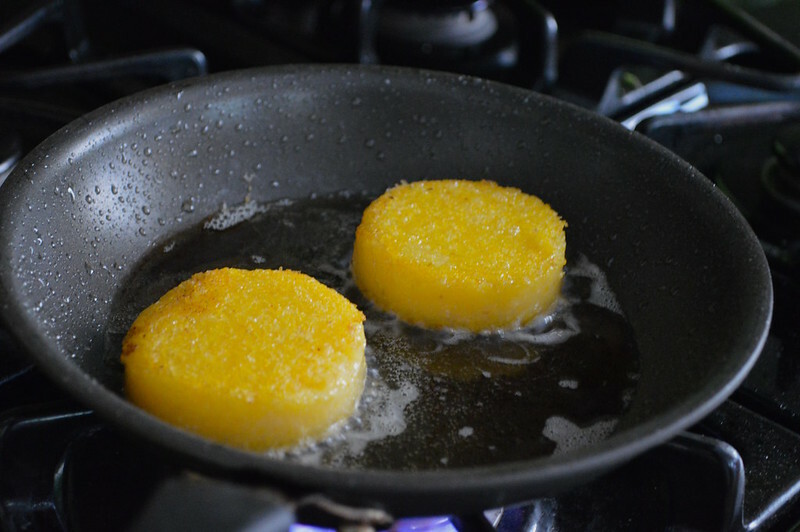 Fry the patties for about 1-2 minutes on each side until golden brown. Remove and drain on a wire rack. 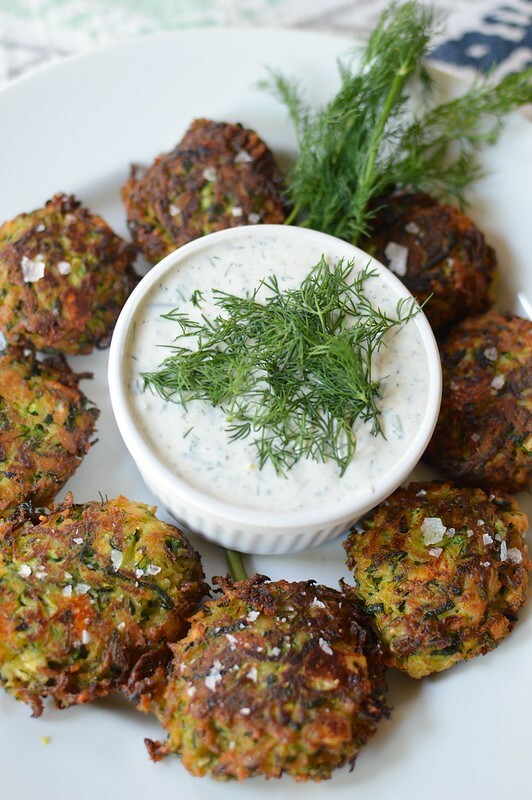 Garnish with fresh dill and serve warm with the Tzatziki Sauce.